Dogs never stop learning. They do it in a formal setting, be it in class, with a trainer or during our own training sessions with them. But it doesn’t end there. Every moment of their lives is a learning moment: some are good, some not so much. They watch and observe, trying to make sense of the world around them. They pay attention to us and to their environment, looking for clues on how to behave. This is especially true for puppies, who are like sponges and soak up every new experience or piece of information. Puppies will also very often turn to other dogs for guidance. They will watch the more “seasoned” canines and then try to mimic their behaviour. 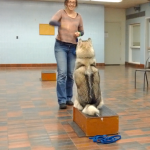 Having an older, more confident dog show your puppy the proper way of doing things, can speed up training and keep your puppy interested and engaged. 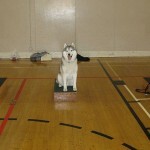 Fearful and anxious dogs can also greatly benefit from being around a calm and confident dog. 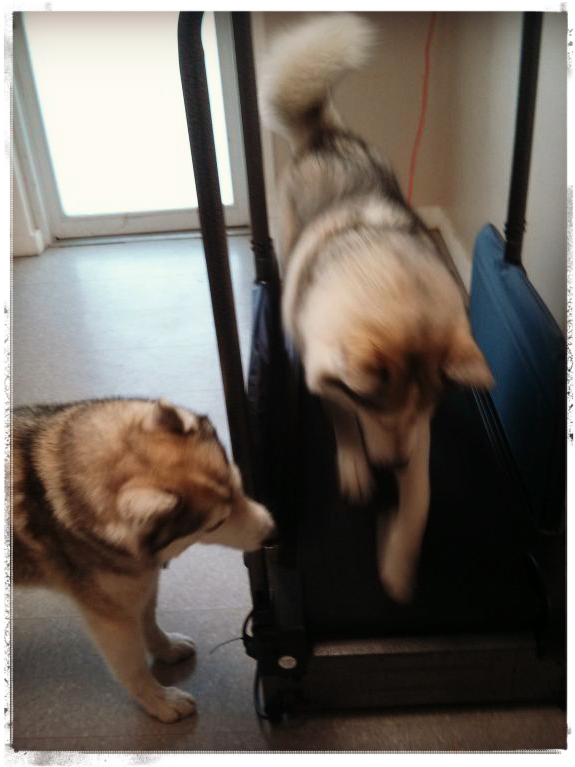 They might feel safer and will be more likely to go out of their comfort zone, while following the lead of their companion. I often ask Rocco to come with me on walks with young and over-exuberant puppies. 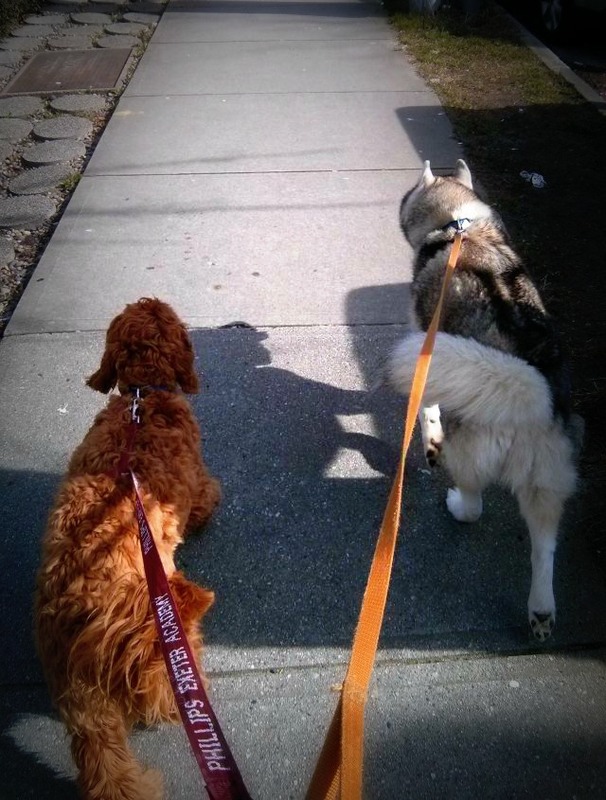 As we walk together, the puppies settle into a brisk pace and follow the lead of the older, more experienced dog. Of course, this only works when the older dog isn’t teaching them any bad habits! Young Darwin trying to imitate Rocco during their walk together. Rocco watching Rave use the treadmill. 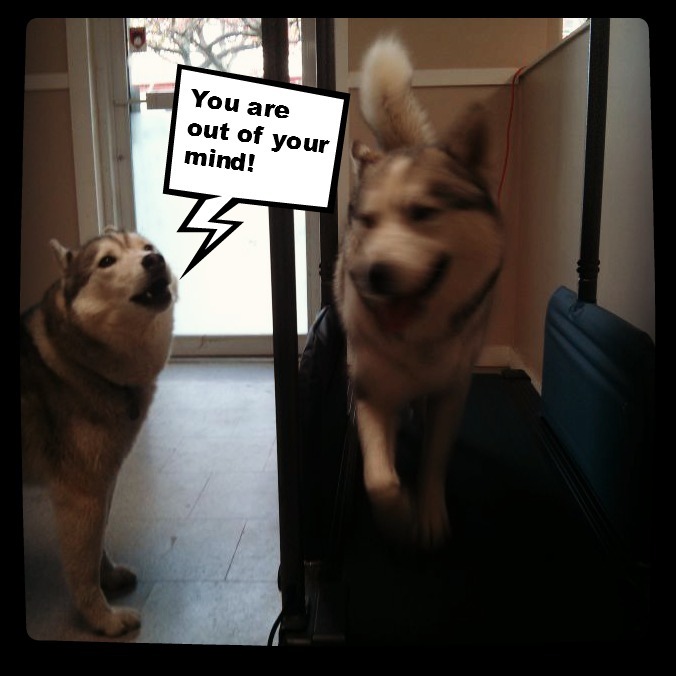 And sometimes they come to their own conclusions…. I agree with the idea of younger dogs learning from older dogs, and anxious dogs learning from calm dogs. I believe that Neeko sometimes keeps my other two dogs calm on walks with her calm, confident demeanor.